ACK--- I STARTED WORKING ON HER BIO YEY! Don't worry, I will finish it and edit it when I can, but this is what I have so far! Edit 1 (March.17.2k18): Added DOB, full name, an how she got her Horror name. Plus, I fixed text font! Edit 4 (July. 2. 2k18): DREW A NEW REF! Edit 5 (July. 17. 2k18): CHANGED UP A FEW THINGS! ^^ And I redrew her! The bio is by ! Also, yes, it's spelled as 'BeggER" and not Beggar. Note: I AM taking constructive criticism for this character's INFO, however, any harsh or mean comments that seem insulting to me or the character will be blocked. The BeggER was actually inspired by two real life human killers, Mary Bell and Lizzie Borden. Both were female, and somehow someway, I attempted to think of a character based off of the two, thus The BeggEr was born! Now, I'm sure you're wondering, how did these two killers inspire the making and character of BeggER. Well it really is quite simple! 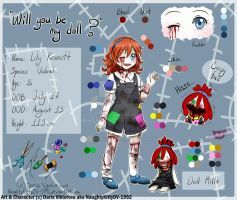 Mary Bell was in inspiration, due to her timeline and her characteristics. Around the time she was alive, it was around the 1950's, which somewhat inspired the look of BeggER, even if I made a few changes to her outfit multiple times. It also made it fiting to have BeggER born around that time. 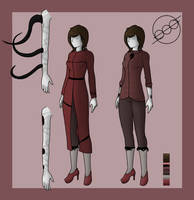 Mary Bell's thought and attitude is what also describes part of BeggER's personality. The girl was simply curious, and she knew what she was doing, but really, she was expressing anger onto what she says, "Weaker victims." BeggER usually does the same, but mostly to small creatures such as cats, squirrels, birds and young pups. And like Mary Bell, BeggER lived in an inner-city suburb type of place. Though I can't really think of any fitting place for BeggER's location. Lizzie Borden was a bit different. Like Lizzie, BeggER had a steo mother, but never had a good relationship with her. As the years went by, you'd think that she'd be able to get used to living with her father and her step mother, but no. The tension just continued to build up. Another similarity between the two would be both of them killing little creatures at such a young age. However both had different reasons. Lizzie wanted a funeral for the baby birds she has killed, and BeggER simply did it on accident with a small pup. Though I think that both of them did it to express anger due to their step moms. I also think that Lizzie's attitude towards her mother somewhat influenced the attitude of BeggER towards those who try to help, or 'comfort' her. 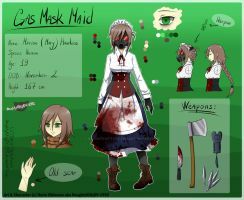 Full Name: Eden Mariann K.
Creepypasta/Horror Name: " The BeggER"
How Did They Get This Name and Why: When she was a more talkative person back then, she would be the type of girl who would beg to do something or to get something. She begged to be teacher's assistant through her middle school and early highschool years so that she could show her aunt how she was able to do something. Of course, she'd beg for other needs just to try and impress her aunt, and sooner or later, her classmates began calling her, "The BeggER" They even wrote it on the board in red chalk, misspelling it on purpose to show how the ER was a place she'd need to go to if she continued to act the way she did. In other words, her nickname was simply a death threat. Orientation/Sexual Preference: Straight if she's ever shipped, or if she gets old enough. If Yes, How’d They Die: .Rumored to have been thrown in the river. Habits: . She has the bad habit of scratching herself. She tends to do this mindlessly when talking to someone, or when getting too caught up in a thought. If someone doesn't stop her scratching, she''ll end up scarring herself along her forearms. -(Scary Face 1): She has the ability to snap her jaw open to a much bigger extent, and she she can use her jaw to bite, eat, and attack. Though, she mainly does use it to give people a strange stare. -(Scary Face 2): If she is upset, or if she somehow gets triggered, her mouth may slowly shift into a strange black void, and the only thing she really does is screech. The sound could be heard nearly about a mile or two away, and it does bring great pain to those who have sensitive ears. She usually uses this to simply just.. Scare away people. Yes, she is dangerous, but she is also terrified at what people may do to her. The reason why thinks that is because she simply just doesn't want to be dragged back to the hellhole she calls home. Or she doesn't want to be isolated. -Brown or dark red on the very outside layer. -Black fading to light brown in the inside layer. Hairstyle: A simple straight cut hairstyle that only has a strange messy left side (Her POV) to cover her left ear. Scars/Weird Marking(s): One around her neck, which seems like faint strangle marks from a certain event. Clothing/Style: She has a simple possibly old timey clothing style. 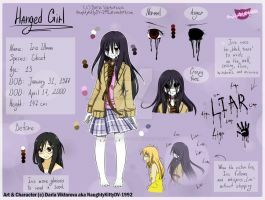 Her clothing is made up of a simple school uniform that has a long knee-passing skirt, a button up shirt, kneesocks, school shoes, and a short sleeved sweater or vest blanketing over her button up. She also wears a choker to hide her scar around her neck, and for some reason wears a matching ankle bracelet on her right ankle. Never Seen Without: A simple smile on her face. 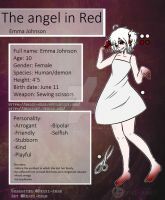 -(Main Personality): She is normally quiet with a simple smile on her face. She rarely speaks, but that doesn't mean she cannot talk, she just chooses to not speak, or pretends that she is a mute. Normally, she would simply follow the person looking after her with a polite smile on her face. 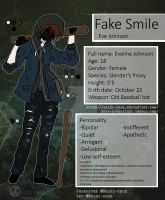 In this state, she is normally... Blank, showing no other emotion except her "Kind" and "Polite" smile. It's what gives others the slight chill of her being creepy. -(When triggered, or in a state of flashback/shock): She has two phases when she gets triggered or provoked. ~Her first phase would be Scary Face 1 (Glance at ref if needed). In this phase, her smile widens greatly and she begins to 'glitch' people say... She simply stands there with that big grin on her face as her eyes slowly fade to black, obviously showing anger. She won't actually do anything, until someone moves, runs, or tries to attack her. If that happens, she will either fight back and bite her victims, or switch to phase 2. 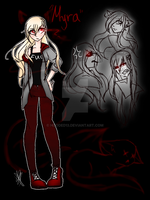 ~Phase two is when her eyes fade to completely black and it is when her mouth splits open to look like a completely black void. She doesn't really try to jump at anyone at first, but when she's extremely angered or upset, she will shift to this phase and release and ear piercing screech that could be heard nearly a mile or two away from where she's standing. The people who are more near her may suffer from serious ringing, but but the real pain begins when she attacks or has a victim in her grasp. Most Prized Possession: Her glasses actually. They were given to her by her first teacher. She looked up to her, somewhat like mother. Worst Way To Die: . Best Way To Die: . Worst Way To Kill: . Best Way To Kill (how they kill): . Favorite Season(s): Early spring and fall. Least Favorite Season(s): Mid summer and mid winter. Why does the teacher have dead mom hair? It's a hairstyle that almost all dead mothers had before dying in anime. that comment was making a reference to a joke in the community. And I thought the joke kind of works since the teacher was a mother figure to BeggER. Can she be friends with Viola?